As we age, our dental needs change. Some seniors have implants, bridges and or dentures; others become more prone to cavities or dry mouth syndrome. Maintaining strong and healthy teeth requires additional precautions. This sometimes means changing the foods we eat — or modifying our dental hygiene routine. No matter what our dental concerns are, tailoring dental care habits to each time in our life is an important step for maintaining good oral (and overall) health. As other physical challenges arise, dental care might fall onto the back burner. The following teeth tips (not just for seniors) can help all of us care for our mouth and body and keep everything performing optimally. 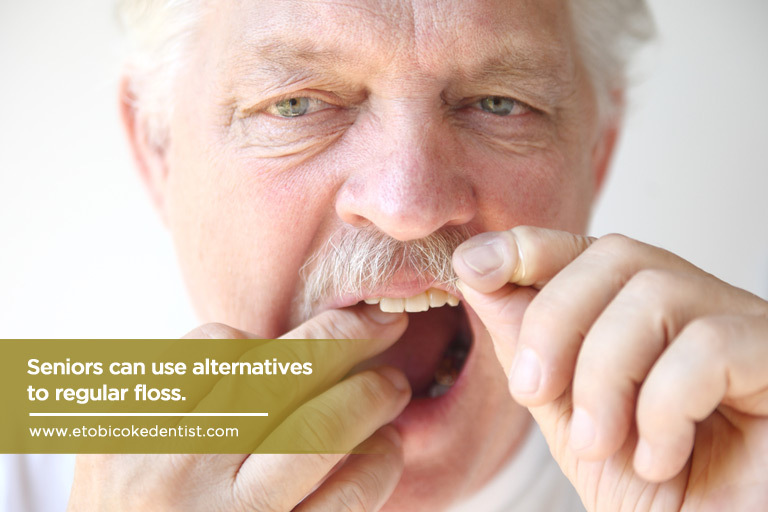 No matter your age, flossing is important. The older we get, the harder it is to floss. Hands can lose agility and strength, and teeth that have been tightly cramped next to each other are difficult to reach. If you’re having trouble using regular string floss, there are other options for flossing. Interdental brushes are one good alternative. All you do is push them through the spaces between your teeth and gum line. Another option is floss picks. These are tiny sticks with two prongs that tightly hold floss in place. You wiggle them up and down between teeth, just like you would with regular floss. If regular flossing is becoming increasingly difficult, alternate between these two alternatives until you find the solution that works for you. As we age, the mouth stops producing as much saliva as it used to. This normal part of aging can have negative consequences for dental health. Without adequate saliva production, acidic foods and bacteria aren’t washed away as frequently or effectively. When bacteria breeds, it causes bad breath and possible cavities. A reduction in saliva production can also lead to dry mouth syndrome. This also affects the ability to taste and properly digest foods. 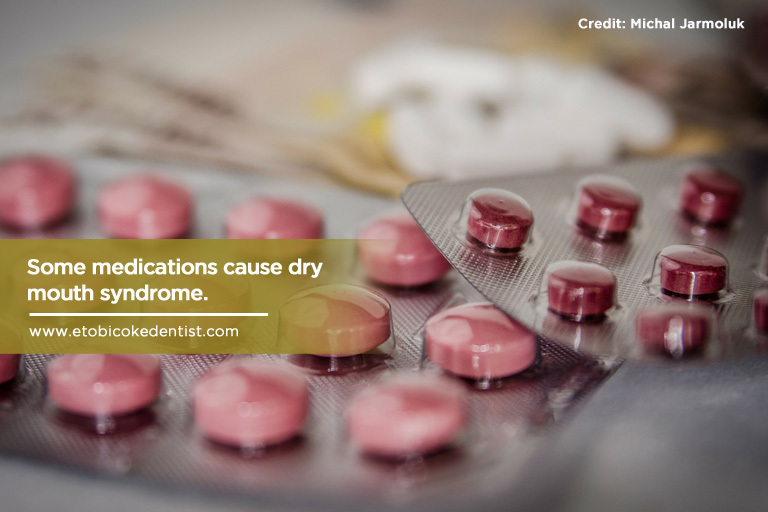 Dry mouth syndrome can be a frequent side effect of some medications. If it is a concern, consider speaking to your doctor about alternative medications. Adding an antiseptic non-alcoholic mouthwash into your dental hygiene routine can help keep the mouth clean (and saliva-producing). Each morning and night, gargle with mouthwash for 30 seconds. Spit it out and don’t rinse the remaining mouthwash lingering in your mouth. Strong mouthwashes can sometimes create a burning sensation; if this happens, choose a mouthwash that specifically targets sensitive gums. Fluoride is an important ingredient in most toothpastes. It strengthens the enamel (the protective outer layer of teeth). When your enamel is strong, it can withstand hot and cold temperatures, acid from bacteria, and even potential cracking caused by chewing on hard foods. Although bones and teeth naturally lose density as we age, we can forestall that effect on teeth with a fluoride toothpaste. Luckily, most toothpastes at the grocery store contain fluoride; double-check before you buy. To improve your teeth’s strength from the inside out, eat a balanced and nutritious diet. Not only will your teeth stay in shape, but the facial and jaw bones that hold teeth in place will be healthier as well. Avoid eating and drinking foods high in acidity (like coffee, sodas, and most processed foods). Refined sugar and artificial sweeteners are also highly acidic and can damage tooth enamel. Calcium – Get your daily dose of calcium. While calcium supplements can be convenient, it’s best to get this major mineral from natural sources when possible. (These include milk, cheese, and yogurt.) 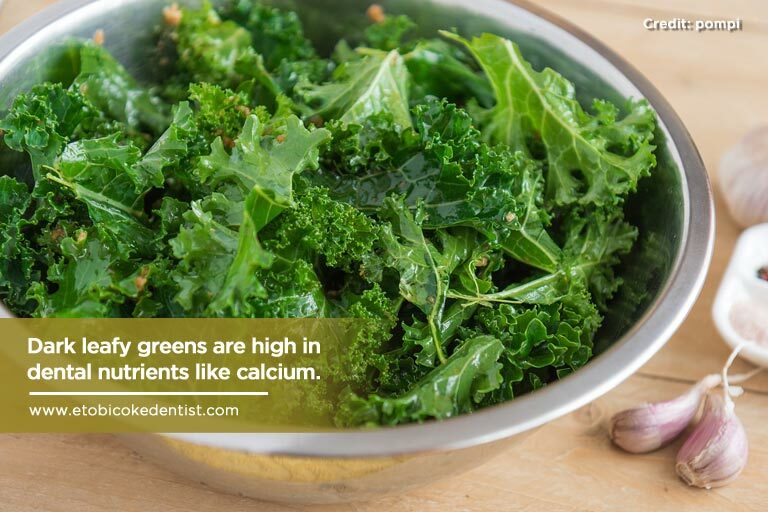 Some non-dairy sources of calcium are dark, leafy greens (like kale, spinach, or broccoli). Most vegetables do not contain vitamin D. However, mushrooms (especially shiitake) are an excellent source of this vitamin. Your body can make its own vitamin D when you regularly spend time outdoors in the sun. The amount you need varies based on skin colour, cloud cover, and age, since some demographic groups naturally produce less vitamin D than others. In general, 10-15 minutes is the recommended “dose” for most people. The tool we use to brush our teeth can be as important as brushing itself. The bristles, style of brush, and grip are all factors that affect the quality of our teeth cleaning. Most all of us should use a soft-bristled brush. They’re gentler on the gum line and less abrasive to teeth. Note: Scrubbing harder does not make your teeth cleaner or whiter. It can, though, abrade tooth enamel — leaving teeth vulnerable to cavities. Use a soft-bristled brush, and use proper technique to firmly but gently clean teeth. For some of us, brushing is challenging. If we have mobility issues or arthritis, brushing can be difficult because of the necessary arm and hand movements. If this is your situation, consider buying an electric toothbrush. Not only do they often provide a better clean, they’re easier to use. An electric toothbrush can simply be held against teeth and do all the work of cleaning. Seniors with arthritis in their hands might have a hard time gripping a regular straight-handled toothbrush. 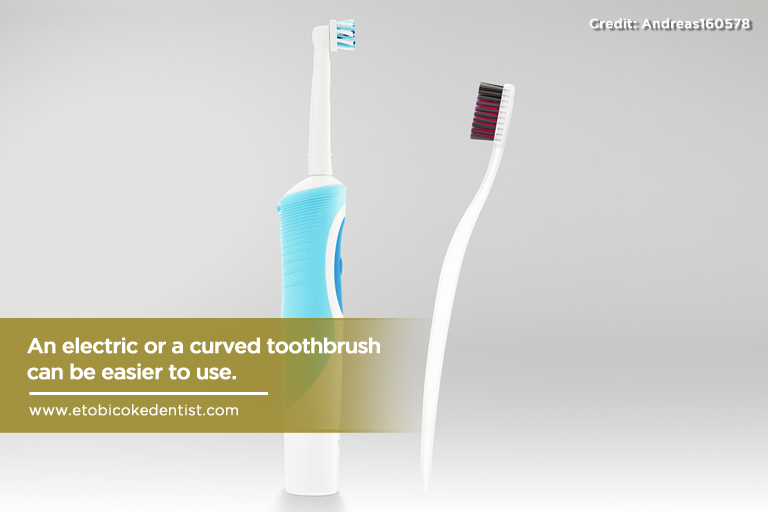 In this instance, consider using a toothbrush with a curved or “hooked” handle. These brushes hang on your hand, requiring little effort to hold them. The dentist may recommend them for those with restricted mobility. Who says you have to brush your teeth in the bathroom? For many of us (and those who rely on caregivers to move from room to room), getting up and going to the bathroom to brush may not be possible. Bring your toothbrush, paste, and a bowl of water to bed with you, or ask a caregiver to bring the supplies to your bed. There, you can brush teeth, rinse with water, and spit into the bowl — No relocation required. Leave the supplies on your night table, or have someone take them back to the bathroom for your morning use. Oral cancer is a disease that frequently affects us in later years, with an average diagnosis age of 62. To protect yourself, get regular dental checkups. Your dentist is trained to spot the early signs of oral cancer. As early diagnosis is key to early treatment, this is important. 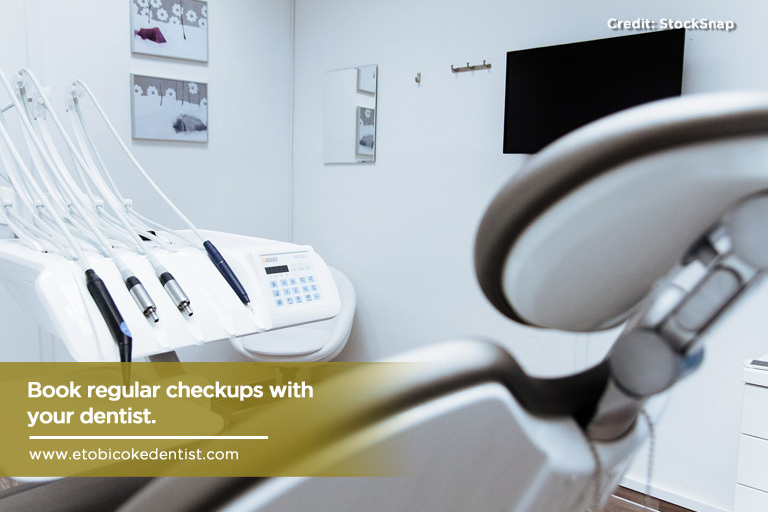 Consider booking a checkup every 6-8 months. If you’re experiencing pain or sensitivity in your teeth and mouth, make an appointment right away. Not only will your oral health care team address any health symptoms, but they can assess your dental hygiene routine and advise how to improve it. The team at Dr. Mark Rhody Dentistry is proud to have served happy patients in Etobicoke for over 18 years. For expert dental care including cleanings, dentures, and implants, we’ll take care of you. To inquire about our dental services or book an appointment, get in touch today: (416) 231-4281.